There are loads of things to love about this time of year, like the cooler weather and the chance to actually catch the sunrise in the morning. But our favourite thing has to be the surge of amazing new autumn menus popping up at our much-loved cafes, restaurant and bars. Boasting amazing local produce and some serious comfort food dishes, here are five of the very best you absolutely have to try this week on the Gold Coast. If you haven’t paid Tasca, a stunning wine bar and restaurant in Cooly, a visit yet, put it straight to the top of your list because the food and atmosphere here are top notch. Tuck yourself into one of their cosy booths, grab a glass of Portuguese wine and order a bunch of smaller plates so you can sample all the goodness. We recommend starting with the zucchini filled with delicate stracciatella and herbs topped with fried onion and the beetroot with radicchio, goat’s curd and pepperberry giving it the perfect little zing. Proving seafood isn’t just for hot summer days, their roasted octopus with sweet and sour currants, white bean and almond is pure melt-in-your-mouth stuff. For something a little heartier, there’s pork chop with hispi cabbage and mushroom and their signature king prawn Bolognese with linguini and fried breadcrumbs. It’s not easy to do, but leave room for dessert, because the flaky salted honey and shaved macadamia tart is the kind of dish that you’ll dream about for weeks to come. The creators of some of the best and prettiest breakfast dishes we’ve ever laid our eyes on, Elk Espresso is back at it again with one of their best menus yet. If you’re the kind of person who struggles to choose between sweet or savoury, order both, you won’t regret it here. Kick things off with the Black Forrest Waffles—raspberry ice-cream, berries, chocolate soil and strawberry gel on activated charcoal waffles—the perfect blend of sweet and zingy, you’ll be going back for seconds. 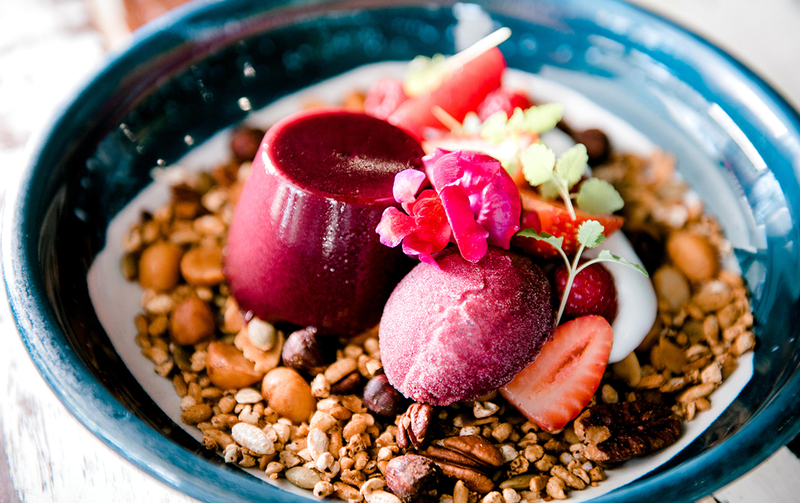 And you can't go past the Blueberry Panna Cotta with maple nut granola, coconut yoghurt and blueberry sorbet. For the savoury lovers, order the Pork Date and Sage Sausage with roast cauliflower, charred leek and fried eggs and the Crispy Skin Salmon with pomegranate labneh, poached eggs, honeydew melon and mint salsa verde. You’ll be hard pressed to find a better-looking breakfast spread. Labart prides itself on using only the freshest, local produce, which is why it’s always a cause for celebration when a new season is upon us. 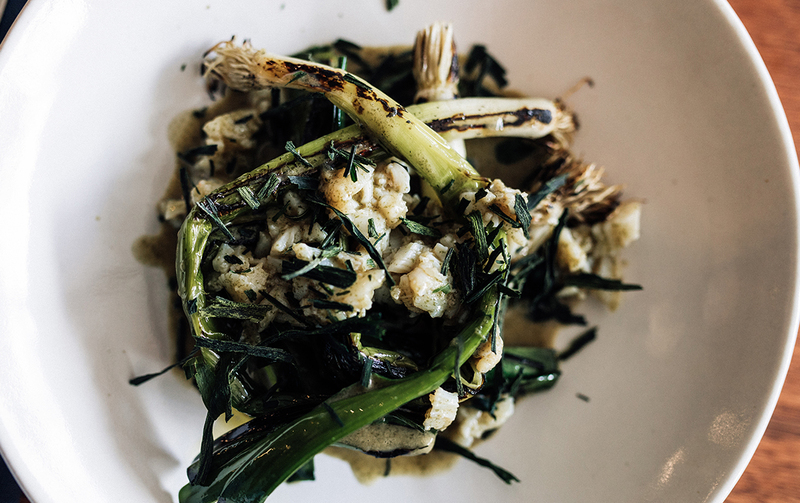 Inching closer and closer to their first birthday, their autumn menu sees the welcome return of some of winter 2018's favourites, like the Apple Pie Ice-Cream with rhubarb and rosemary, as well as the Spanner Crab with charred leek and roasted prawn broth which is perfect for mopping up with a Burleigh Baker roll. New additions—which we guarantee will become your new favourites—include the melt-in-your-mouth 400g Black Angus rib eye au poivre, the duck with plum, thyme and duck jus, and the Snapper with rapini and a pistachio and herb sauce so tasty you’ll want to lick the plate. For something a little lighter, the iceberg lettuce with radicchio, parmesan and garlic dressing has confirmed winter salads are what we were missing in our diet. If there’s one activity that goes perfectly with the recent drop in temperature, it’s drinking cocktails. And no one knows that better than the crew at The Cambus Wallace, who have overhauled their tipple menu with 12 delicious and diverse newbies specially curated to compliment cooler climate produce. There’s the BFG Punch—served long, it marries the beautiful botanicals of Brookies Dry Gin to sweet fig, fresh grapefruit, marzipan and mint. Or grab the Mellow Yellow, a combination of bee’s wax gin, herbal liqueur, preserved rockmelon, lavender and citrus and the Dirty White Negroni. With their moody lighting and roster of sweet live music, this joint is the perfect spot to pull up a stool this autumn. Tucked into the Cornerstone Stores, Stable is fast becoming a breakfast and lunch go-to for simple yet delicious fare. Drawing on Middle Eastern and Asian cuisines, their new autumn menu is packed with warming delights. For breakfast, grab the moreish and guilt-free Banana Porridge with salted caramel tahini, coconut yoghurt and buckwheat kernels. Other standouts include the Linseed and Buckwheat crepe with stewed apple, plum, wattle cashew crème and macadamia crumble, and the Turkish Cilbir with roast garlic labneh, quinoa, poached eggs, pickled cabbage and sumac spiced butter. At lunch, you can’t go past the Laksa or Bahn Xeo with organic pork belly. When you’re done, walk off your meal with a spot of shopping at the Cornerstone Stores.